A painting of a Wilson’s snipe has been chosen by a panel of judges as the winning entry in the 2017-2018 California Upland Game Bird Stamp Art Contest. The painting was created by Jeffrey Klinefelter of Etna Green, Ind. Sponsored by the California Department of Fish and Wildlife (CDFW), the annual contest is held to determine the official design for the upcoming year’s California Upland Game Bird Stamp. Artists submitted their own original depiction of a Wilson’s snipe (Gallinago delicate), a charismatic, diminutive migratory game bird. The individual artists determined the setting and details, but entries had to include at least one Wilson’s snipe and be representative of the species’ natural habitat in California if a background was included. The entries were judged Wednesday by a panel of experts selected for their knowledge in the fields of ornithology, conservation, art and printing. Designs were judged on originality, artistic composition, anatomical accuracy and suitability for reproduction as a stamp and print. 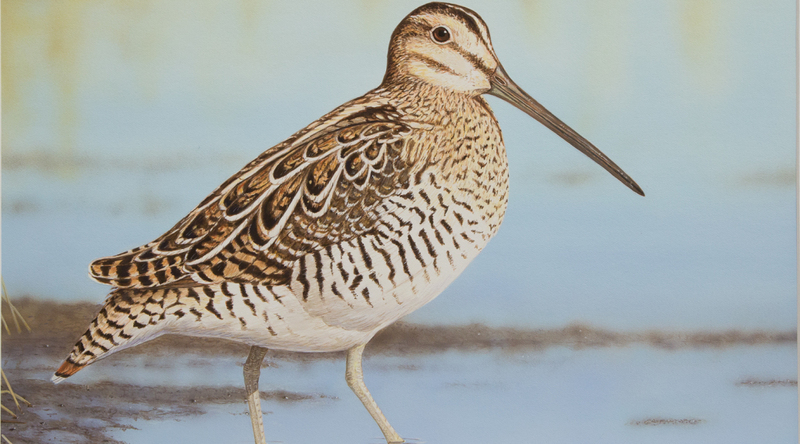 Klinefelter created the painting based on his photograph of a Wilson’s snipe – after simplifying the original habitat with the intent of highlighting the bird. Broderick Crawford of Clayton, Ga., placed second, Lawrence Simons of Lebanon, Ore., placed third and Erik Fleet of Julian (San Diego County) received honorable mention. An upland game bird validation is required for hunting migratory and resident upland game birds in California. The validation replaces the stamp through CDFW’s Automated License Data System, but the stamp is still produced and available to hunters upon request. Money generated from upland game bird validation sales are dedicated solely to upland game bird-related conservation projects, hunting opportunities and outreach and education. CDFW annually sells about 175,000 upland game bird validations and distributes approximately 17,000 stamps. Estimating Factors That Influence Population Vital Rates and Space Use Patterns of Pheasant in the Central Valley of California. The ring-necked pheasant was introduced and established in North America during the 1800s and has long been a popular game bird for hunters. Although pheasants flourished in California during the 1900s, changes in agricultural and land-use practices in the latter half of the 20th Century reduced the amount and quality of habitat available to wild birds in the state and hunter harvest declined. This project uses telemetry to monitor pheasants and estimate population rates in different regions of the state. This information helps the support and maintenance of wild pheasant populations. For more information, please visit www.wildlife.ca.gov/conservation/birds/pheasant. Habitat Development and Enhancement Projects at Gray Lodge Wildlife Area. The project will improve approximately 149 acres of upland nesting and foraging habitat for pheasants, turkeys, doves, quail and other upland wildlife species at CDFW’s Gray Lodge Wildlife Area in Butte County. These improvements will enhance the department’s ability to manage water and increase the recruitment and survival of wildlife. The project will improve items such as nesting and foraging cover, and should result in higher pheasant, turkey, dove and quail populations. As all of the fields are located in the hunt area, the project will provide additional hunter opportunities. For more information, please visit www.wildlife.ca.gov/grants/upland-game-bird/projects. Any individual who purchases an upland game bird validation may request their free collectable stamp by visiting www.wildlife.ca.gov/licensing/collector-stamps. An order form is also available on the website for collectors who do not purchase a hunting license or upland game bird validation or for hunters who wish to purchase additional collectible stamps.